Snow Catch You off Guard? Don’t Rush When Hanging Outdoor Lights! More than a few of us have been caught off guard this past week with the unseasonable amount of snow fall! For most of us, the snow brings memories of dazzling lights on beautifully decorated homes, thoughts of crackling logs on the fire, quality time with family and friends, and, wait…..did we say lights….dazzling lights? Well, yes. There is nothing like them to signal the arrival of the holiday season! Now, that leads us to memories of wrestling the old ladder out from under a pile of summer gear in the garage, and untangling strand after strand of lights. Is there enough eggnog around to make decking the outside of our homes a holly jolly experience? Here are some important tips to keep you, and your home safe and shining as brightly as Rudolph’s nose in a November snow storm. Only use lights (and power strips/grounded extension cords) designed for outdoor use. Before decorating, check lights for damage (frayed wires, cracked sockets or loose connections) and discard/repair any damaged sets. Try to use energy efficient LED lights, which use about 10 percent of the electricity that incandescent bulbs do. LED technology produces very little heat, which in turn reduces the risk of fire. 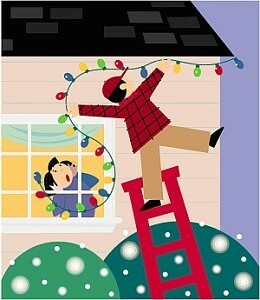 Always have someone else working with you when hanging Christmas lights or decorations from a ladder or roof. Stay centred between the rails of the ladder. Do not overreach to hang lights or decorations—move the ladder. Now go ahead…..trip the lights fantastic!